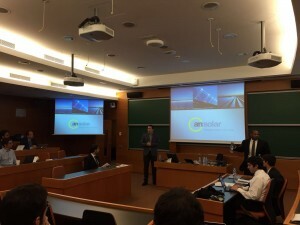 ARI Solar takes part in the New Energy Impact Competition 2016, event organized by IESE Business School. The event which took place in Barcelona, gathered 50 attendees between companies and investment funds. There, ARI Solar was awarded Best Investment Opportunity among all submitted projects. This recognition strengthens ARI’s works and raises the interest of many investment funds which see ARI as reliable value.